Technology has revolutionized almost every aspect of modern life and medicine is no exception. We’ve seen incredible advances in both the types of care available, and in how that care is delivered. Chiron Health is leading the charge toward more convenient access for patients and simplified reimbursement and compliance for providers with our telemedicine platform. What is a Telemedicine Platform? Telemedicine is the use of medical information exchanged from one site to another via electronic communications to diagnose and treat patients. It includes a growing variety of applications and services using two-way video, email, smart phones, wireless tools and other forms of telecommunications technology. You may be surprised that telemedicine has been around for over 40 years, with demonstrations of hospitals extending care to patients in remote areas starting that long ago. Today, the use of telemedicine is becoming more widespread as the technology barriers have been overcome. Chiron Health’s telemedicine platform is a software solution that enables remote medical visits with HIPAA compliant video over the internet. Our solution is secure and easy to use for patients. For providers, it eliminates concerns about both compliance and reimbursement. The use of a telemedicine platform enables providers to serve the health needs of patients more efficiently and cost effectively. This is essential given our aging population and the increase in the occurrence of chronic diseases like diabetes, congestive heart failure and OPD. Telemedicine is one way to help ease the burden on our strained healthcare system. Telemedicine is also an effective way to improve health outcomes. Patients are more likely to seek care and keep follow up appointments when they can avoid the cost and inconvenience of travel and time away from work and family responsibilities. Hospitals with outlying clinics, particularly those in rural areas, are frequently connected using dedicated high-speed internet lines. Private, high speed networks are used by hospitals and others that deliver services to independent medical service providers. These include radiology, mental health, stroke assessment and intensive care. Remote patient monitoring for care provided to patients in the home, such as fetal, cardiac or pulmonary monitoring is accomplished over land-lines, wireless connections or the internet. This category includes the growing number of providers who directly connect with patients over the internet to perform remote visits using real-time audio and video. 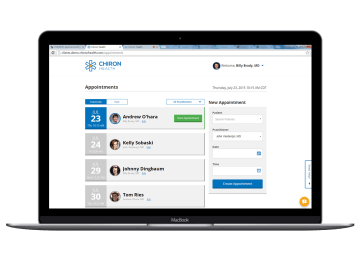 Chiron Health has brought together a team of experts who understand telecommunications technology, medicine, medical accounting and security to create a telemedicine platform that both patients and providers love. Our solution eliminates the challenge of scheduling telehealth visits by integrating with your Electronic Health Record (EHM) / Patient Management (PM) systems. Our reimbursement specialists verify the eligibility of every patient and guide you through any payer-specific billing nuances and different state laws. Our regulatory team will provide you with all legal documentation, including patient consent, that is required when care is delivered via a telemedicine platform. Our platform is fully encrypted and we execute a Business Associate Agreement (BAA) with every client so that our customers remain HIPAA compliant. Our experts provide high touch technical support for both providers and patients. With in-app support, our team is able to catch technical issues before a provider’s time is ever wasted. We guarantee full reimbursement for video visits from private payers (usually at the 99213 – 992147 level). If a Chiron approved claim is ever denied, we’ll reimburse it ourselves. Chiron Health’s telemedicine platform supports the growth of this important channel for healthcare delivery. The solution helps to increase access to healthcare for every patient and provides a safe, efficient and easy to implement care delivery option for providers. Our team is available at your convenience to chat about how it might make a difference for your practice. Ready to offer telemedicine to your patients?